Text: Gosh super! we hav something to contend with which no other generation have ever had before i.e. the television cheers cheers cheers. Everybody know wot a t.v. is it is a square box with a screen. You switch on and o hapen, then just when you have given up hope and are going off to buzz conkers a great booming voice sa, ‘That’s an interesting point, postelthwaite. Wot does higginbottom feel? Higginbottom? ect. ect.’ It may be an interesting point but i could not care less and just go away agane when a ghastley face suddenly appere. 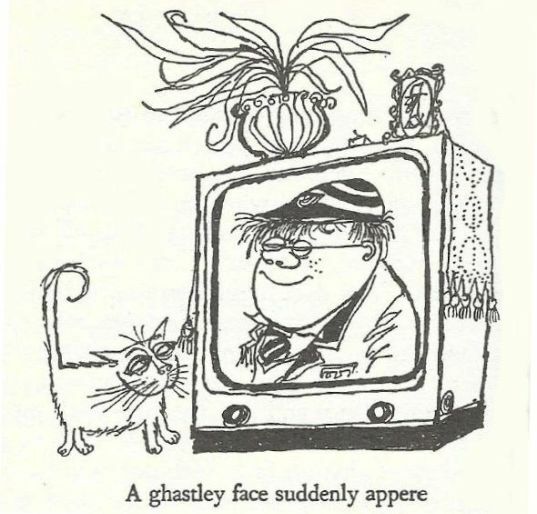 It is worse than a squished tomato but it hold me in hypnotic trance and it is the same with molesworth 2, tho he always look dopey like that. We sit and watch more and more ghastley faces with out mouths open and even forget to chew the buble gum we are the slaves of the machine. Of course all boys and gurls have to go through a time when there is no t.v. xcept at the postman’s down the road. Yore mater and pater then sa weedy things. i will not hav one in the house. the programmes are simply terible, my dear. it is bad for children. it destroy the simple pursuits of leisure. Hem-hem if they only knew what the simple pursuits of leisure were like potting stones at vilage oiks or teaching parot rude words they would not hesitate for a moment. Anyway they get one in the end and sa ‘Children can only look for 1 hour at suitable programmes’ then they forget all about it until we are halfway through ‘1984’ and molesworth 2 sa ‘if that is the best a rat can do i do not think much of it.’ ‘The rat,’ i sa, ‘is exactly like thou, o clot-faced wet.’ Then mater become aware of our presence and hury the dreamy-eyed little felows up wood hill to blanket fair, as dear nana sa. Scene: A darkened room with glowing fire. Mum, Nana, me and molesworth 2 are goggling at the screen. So are the cats, dogs, rats, mice and various bugs about the place. PATER: Are you looking at that friteful thing agane? Programmes are terible. Nothing to look at. (With a roar and a ratle he put coal on the fire). MOLESWORTH 2: Ah-ah-ah-ah-ah. Got you. MATER: Do you not think it would be better if their heads were not three feet away from their shoulders? MATER: You have ruined it, clot. MOLESWORTH 2: Adjust the definition. ME: Oh gosh, hurry up. MATER: look at tibby the cat he canot stand Gilbert Harding…..
Aktually t.v. is v. cultural for boys and improving to the mind. You learn so many things than when you go back to skool all are quite surprised. MOLESWORTH 1: To the q. whether the hydrogen bomb should be banned i give a categorical ‘no’. unless there can be international agreement to co-exist in disarmament. MOLESWORTH 2: That is a valid point, o weedy wet. Do you kno the population of chile? MOLESWORTH 1: No. But everyone should look both ways before crossing the road and wot can be more dramatic than man’s fight against the locust, eh? MOLESWORTH 2: The problem of asia is the problem of over-population and now i will pla brahms etude number 765000 in F flat…. Comments: Geoffrey Willans (1911-1958) was a British schoolmaster and comic writer and Ronald Searle (1920-2011) was a British illustrator. Together they created the comic character of Nigel Molesworth, a pupil at dilapidated boys’ school St Custard’s, whose distinctively mispelt exploits were first documented in Punch magazine (from 1939) and then in four books. ‘Hee-Hee for Tee-Vee’ is the title of a chapter in the third book, Whizz for Atomms. Searle also created the rebellious girl’s school St Trinian’s. The BBC television production of George Orwell’s 1984 was first broadcast on 12 December 1954 and aroused much controversy for its ‘horrific’ scenes. The quiz show parodied here is What’s My Line, first broadcast by the BBC in 1951 and based on an American original. Gilbert Harding was a regular panellist on the show. 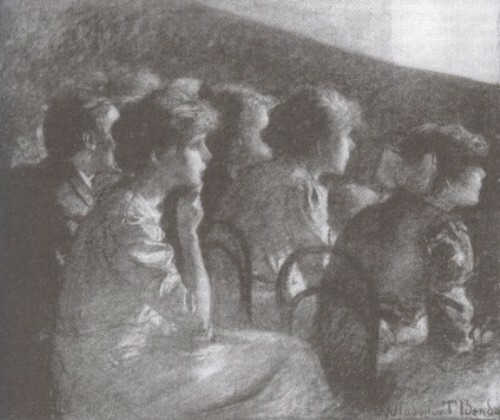 Dramatic picture interference was a common experience for television audiences in the 1950s. This entry was posted in 1950s, Humorous sketches, United Kingdom and tagged 1984 (1954), Breakdowns, Children, Domestic, First impressions, Geoffrey Willans, Nature, Parents, Picture quality, Quiz shows, Ronald Searle, Television, Television sets, What's My Line? (1951). Bookmark the permalink.